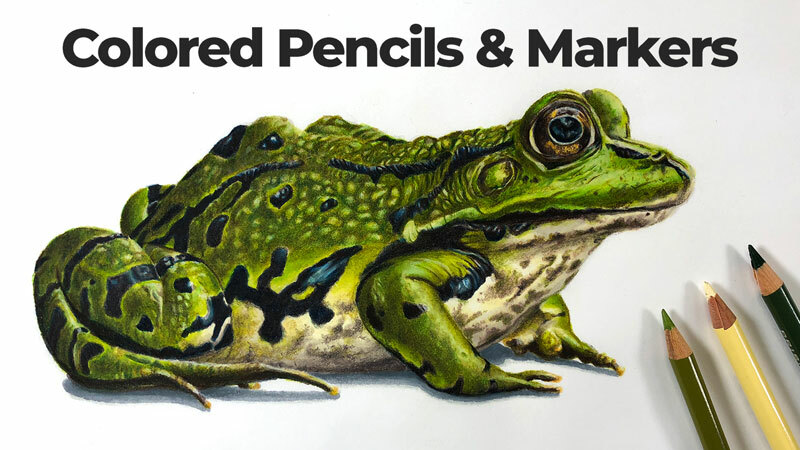 Create a realistic drawing of a frog with markers and colored pencils. We develop an underpainting with alcohol-based markers before layering colored pencils over the top. Learn why this combination of media leads to a realistic drawing and see how it's done. Outstanding Matt. Your Kermit voice needs some work. Yes I agree, not my best effort. Some of the members watching the live lessons bring up the different markers and paper. I will use the recommended markers/pencils on the Canson marker paper – experimenting with Strathmore 400 Marker paper. It’s a heavier paper, smooth and the results ?? I will advise. Your having fun, so this venture should be fun for me. You mentioned that white gouache would be used towards the end of the project. Can Brush & Pencil’s Touch-up Texture Titanium White be used, instead of the gouache? Yes, I think that would work as well. Any opaque medium that can adhere to the colored pencil applications should work without issue. Will you be posting list of colors used both markers and pencils. Yes, I can do that. But I don’t know what pencils I’ll be using until the work is completely finished. I started with Indigo blue for the eyes and overpowered so much that none of colors I applied stood a chance… Is there a way to alter it or redo the eye? like applying gulch /opaque pain? I wish i can show you my frogs eyes for you to understad it better. I tried downloading Video #9, but Vimeo is acting strange. When I click on the download arrow, the download box pops up, but it just sits there, not giving me the option to pick the resolution link of my choice. I removed my history files and cookies, etc, but still no go. Suggestions, or is it just Vimeo? I’m using the Chrome browser, that has never had an issue before today. This is a current issue with Vimeo. Hopefully they’ll have it resolved shortly. I’m having the same problem – except that mine starts with Lesson 1! I can’t download any of the lessons. Like you, I use Chrome and have never had any problems before. As Matt says, hopefully Vimeo will resolve this very soon. What brand of Alcohol Markers are the best? I want to some off Amazon but don’t know which brand. Also, what if you don’t have this specific colors of the color pencils can you use shades that are close? What is the best marker paper you’d suggest .. I have Bienfang and it bleed through three sheets. I have a set of Touchnew markers ( Amazon) that I purchased about three months ago. When I started doing this project, I found that several of the markers had dried out. Is there any way to moisten them up again?